The first pictures had a relatively low amount of neon and flash, but after reviewing the related story elements, the design team decided to kick up the glitz. The before and after screenshots are dramatically different. Read the full article and see several screenshots here. Plenty of new fan art and forum icons to peruse. Ask A Jedi got a much-deserved nod with this month’s Fan Site Spotlight. 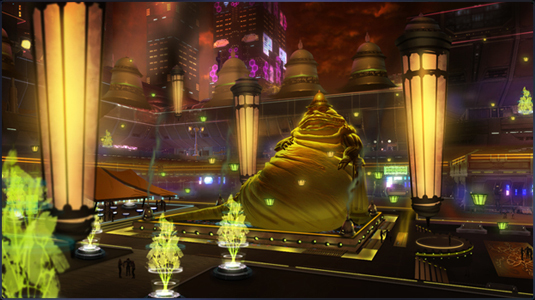 Pretty piece of concept art featuring Corellia. Poll: What did you enjoy most from our E3 coverage? Poll: What is your favorite piece of extended universe content relating to Star Wars: The Old Republic? BioWare toots its own horn a bit! The reaction of fans and media was overwhelmingly positive, with SWTOR winning fifteen awards from various media outlets Read the full article here. I really enjoyed the article about the writing and how they are “forced” lol to play the game to work on polishing up. That sounds promising. It is also very interesting, because I would love to get into writing for game design. The one thing, can some of the people ease up a bit in the comments on the TOR site. I want the game to come out soon, but all the ones begging for a release gets old. Bioware will release it when it is ready. The polls, I voted for the DE walk-through with the bounty hunter and jawa companion-Blizz! That was just awesome. On the other poll, I voted for Deceived. It is a great book! No spoiler, but I did think that maybe ended a bit abruptly. Definitely, playing the game as part of your work sounds too good to be true to us poor, SWTOR-deprived fans! I really liked the DE walk-through on Tatooine also…but I also loved the Alderaan demo with Daniel E. Very exciting to hear about group content outside flashpoints and raids.